Is This Serious? Why Do my Knees Crack? We’ve all heard the loud pop or cracks that can come with a full knee bend, whether it’s in yoga class, at the gym, or just stooping down to pick something up. 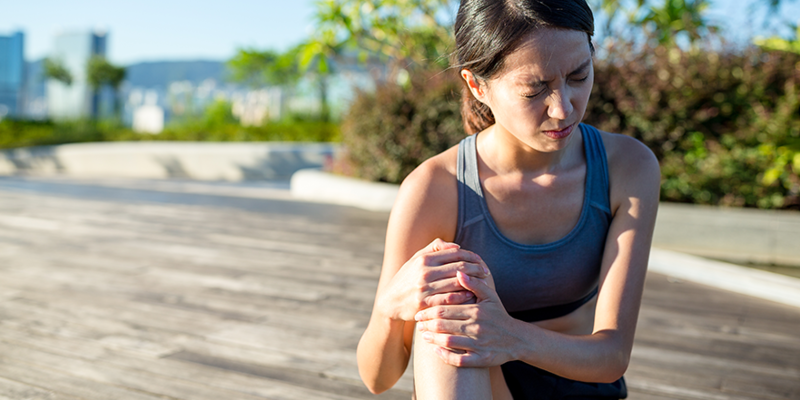 Because these signs can be concerning, we’ve pulled together a summary of the symptoms, possible causes and treatment options for cracking knees. If you’re seeking medical care for your symptoms, find a physiotherapy clinic near you and book an assessment for cracking knees today. The main symptoms that cause concern are a cracking or popping when the knee hits its full range of motion. For most people, this is completely harmless: it happens as a natural result of aging. As the cartilage on the joint starts to wear, it becomes uneven in certain places. What you hear could be the rough spots moving over one another, or the tissue that connects bones together (ligaments) tightening, or even just air bubbles “popping” from a change in joint pressure. All in all, nothing to worry about. It’s when the cracking noises come with pain or swelling that you’ll want to take the issue more seriously. If you’ve noticed pain or swelling accompanying your cracking knees, book an assessment with a physiotherapist near you today. Pain or swelling in the knee, combined with the cracking noise, is a sign that something is out of alignment. The rubbery C-shaped disc (meniscus) is designed to cushion your knee, absorbing shock and spreading the weight of impact evenly across your bones. Tearing can happen because of an unexpected twist or turn, especially during athletic activity, often when the knee moves but the foot stays planted. As you age, you have a higher risk of tearing the meniscus, even with everyday activity. In an injury, knee cartilage can break off and catch on the joint, which causes pain and swelling. Or, the cartilage may wear down from arthritis, which leads to a painful grinding feeling during movement. If you’re concerned that either of these causes could have led to painful or swollen cracking knees, find a clinic near you and book a physiotherapy assessment today. The key is to seek treatment early, which leads to a faster and more effective recovery. If you’re concerned about symptoms of cracking knees, book an appointment with a qualified physiotherapist to get a full assessment and treatment plan in place.